The main trades for the area include cotton, corn, truck manufacture, dairying and lumbering. 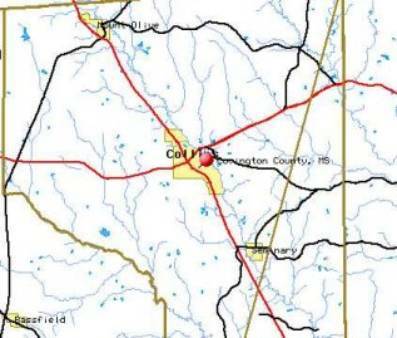 Covington County is situated in the south central part of the State to the West of Route 89. West and South of Route 32. N and was established from the counties of Lawrence and Wayne January 5, 1819, a short time after Mississippi became a State. Its name was given in honor of Gen. Leonard Covington. It is bounded on the west by the county of Lawrence, the old Choctaw boundary forms its northern line and separates it from Simpson and Smith counties. The county of Jones bounds it on the east and the counties of Marion and Perry on the south. It is now almost a perfect square, the county seat being located at Williamsburg at the very center. The original act defined its boundaries as follows: --"Beginning on the eastern boundary of the eighteenth range line where it intersects the southern boundary line of Lawrence county; thence north along the said range line to its intersection with the dividing ridge between the waters of Leaf and Pearl rivers; thence along the summit of said ridge to its intersection with the Choctaw boundary line; thence easterly along that line to the eastern boundary of the tenth range line; thence south along the said range line to its intersection with the northern boundary of Green county; thence west along the said line to the corner of the said county of Greene; thence along the fifth parallel township line to where the same intersects the eighteenth range line." In 1823 the dividing line between Covington and Lawrence was declared to be: "beginning on the eastern boundary of the 18th range line, where it now intersects the northern boundary of the 5th township line; thence due west four miles; thence due north to Simpson county line." In 1826 all that part of Covington lying east of the center of range 14 was taken to form part of the county of Jones. The present line (1907) between Covington and Lawrence has been fixed at a line drawn north from the southwest corner of section 33, township 6, range 18 west, to the old Choctaw boundary line. Its present area is about 16 townships or 577 square miles. The following is a list of the county officers during the year 1819, when the county was first organized: John SHIPP, John SNOW, Thomas COLBERT, Isaac BOLES, Joseph McAFEE, Justices of the Quorum; John B. LOW, John c. THOMAS, Uriah FLOWERS, Abb. L. HATTIN, Duncan THOMPSON, Justices of the Peace; Gowen HARRIS, Assessor and Collector; William BUD, Sheriff; Stephen SHELTON, Coroner; Norwell ROBERTSON, SR., County Treasurer; Norwell ROBERTSON, JR., Ranger; John GRAVES, Sr., County Surveyor; Archibald McPHERSON, Joshua TERRIL, Richard FLOWERS, William DUCKSWORTH, Constables. Some of the other towns in the county are Seminary, Pickering, Sanford, Collins (the County seat), and Mt. Olive, all on the line of the Gulf and Ship Island R.R., which crosses the entire county in a southeasterly direction. The Mississippi Central R.R., from Hattiesburg in Perry county, also crosses the extreme southwestern border of the county and is projected to extend west to the Mississippi at Natchez. The county is watered by quite a number of creeks, the largest being Okatoma and Bowie creeks tributaries of the Leaf river. The general surface of the region is undulating and there are extensive areas of valuable long leaf or yellow pine on the uplands, and oaks, hickory, ash, beech, magnolia, etc., along the creek bottoms. The soil is that common to the long leaf pine region and is rather thin and sandy except in the bottoms, which are very fertile. It produces cotton, corn, oats, potatoes, sugar cane, sorghum, ground peas, field peas, and a great variety of vegetables and fruits! The county, though a very old one, developed slowly. Since the advent of the railroads a few years ago it has been much more prosperous and many new settlers have located within its borders. One result being the rapid exploitation of its valuable forests. The United States census for 1900 shows that there 1,966 farms with a total acreage of 252,427, of which 59,664 acres were improved. The value of the land was placed at $794,470, exclusive of the buildings, value of the buildings $455,870, value of the live stock $384,465, and the total value of farm products not fed to stock $748,350. The total number of manufacturing establishments in the county is given at 42, total capital invested $276,521, total wages paid $80,399, cost of materials $124,998 and total value of products $336,878. The total assessed valuation of real and personal property in the county in 1905 was $2,896,869 and in 1906 it was $4,252.753, which shows an increase of $1,355,884 during the year. The population of 1900 consisted of whites 8.471, colored 4,605, a total of 13,076 and an increase over 1890 of 4,777. The population has greatly increased since 1900 and in 1906 was estimated to be at least 20,000. Artesian water has been found in various parts of the county--notably at Collins, Mount Olive and Mice. For the past three hundred years, Natchez has been an influential centre for Indian settlements for the Natchez District; and for the preservation, interpretation, and celebration of local and regional history. To aid researchers studying the city, its varying roles, and its society, this guide itemizes the following sources available in the manuscript collection of the Mississippi Department of Archives and History.The following items extracted from this guide refer to records relating to Covington County. Ivanhoe Plantation Records, 1821-1823; 1864. 0.66 cubic ft. This collection contains financial records attributed to Alexander Covington's administration of the estate of his brother, General Leonard Covington, War of 1812 hero killed at the Battle of Chrysler's Field in 1813. 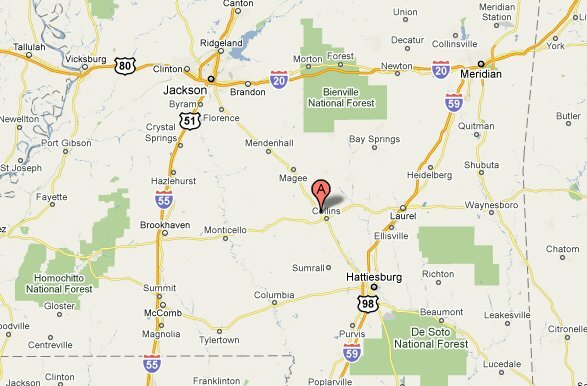 General Covington lived at Propinquity, Adams County, MS, prior to the war. The estate records cover the years 1821 to 1823. Also included are the 1864 records from Ivanhoe, the Warren County plantation of Susan C. Covington, which was managed for her by B. L. C. Wailes. Unprocessed. (Z/U/86.020). Levin Covington Diary, 1825-1845. 0.33 cubic ft. and 1 reel 35 mm. microfilm. The diary contains the minutes of the Adams Athenaeum, Washington, Adams County, MS, from 1825 to 1826, as well as the plantation diary of Levin Covington of Adams County, from 1829 to 1845. A microfilm copy is available for patron use. Processed. (Z/0132.000).